I'm pleased to say that I can finally announce the start date for the Hartland Aikido Club. The venue will be the Bucks Cross Village Hall, between Bideford and Hartland, and the first lesson will be on March 15th this year (2012). Thereafter, we'll be practising regularly on Thursdays between 7 o'clock and 9 o'clock. Directions can be found HERE. If you've never practised Aikido before, let me give you an idea of what to expect. Aikido is a Japanese martial art that emphasises the power of relaxation. So while you will learn practical self-defence techniques, you will also learn how to remain calm under pressure - something that you may find useful in daily life. Our Aikido Club aims to be a welcoming and friendly place for both women and men to practise. Aikido is an enjoyable art and you can practise Aikido even if you are not in the first flush of youth! If you have any worries about practising, or if you have any specific medical problems that might prevent you practising certain techniques, please just have a word with the instructor (that's me) at the start of the class. Almost always it is possible to find ways of practising Aikido even if you are not 100% fit. If, on the other hand, you are looking for a vigorous, active activity, Aikido provides that too. We are incredibly lucky to be able to run our Aikido Club in one of the most beautiful parts of Britain. 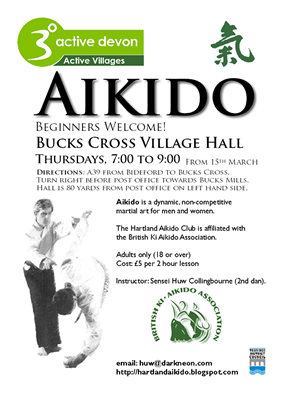 If you do Aikido elsewhere in the UK and you want to visit our club, we'd be delighted to see you. If you need more information, use the Contact form to send me an email. If you live locally, please help us spread the word about our new club. Perhaps you could display a small poster in a window or on a noticeboard (similar to the one shown above)? If so, let me know and I'll email you a file which you can print out on A4 paper. Remember, we start at 7 o'clock on Thursday, March 15th. The lessons are suitable for beginners. Just be sure to wear something loose-fitting and comfortable (such as a tracksuit) and please wear slippers or sandals so that you can leave them at the side of the mat during the lesson.